There are many stories relating to the formative years of MG with many writers and historians each hoping that they have the definitive account of how MG came about. A known fact is that Cecil Kimber was appointed to the position of General Manager of Morris Garages Limited in 1922 having previously been the sales Manager for just over a year. They were the Oxford based distributors for Morris Motors and were owned by William Morris who also owned the production plant in Cowley. Kimber found himself in charge of the day to day administration of a very busy company and it was a tremendous opportunity that he jumped at, particularly as his previous appointments in the motor industry had frustrated him. Within a very short space of time he turned his attentions to developing special bodies for the standard Morris Cowley chassis. There was a call for non-standard cars from customers who did not want the 'run of the mill' item and it was quite usual for some of the larger garages to offer this kind of service with assistance from outside coachbuilders. Kimber was certainly not inspired by the existing range of Morris models and he was well aware that there was a ready market, albeit a small one, for cars with a more sporting appeal. Morris already offered a fairly wide range of body styles on their standard chassis but Kimber decided that these cars would lend themselves to modification without major expense and he set about designing and drawing new bodies that could be fitted easily to the existing chassis. His first offerings were produced in 1922 utilising the chassis and running gear from the cheaper of the bullnosed Morris cars, called the Cowley. With modified lower suspension and a raked steering column, the cars sold for about the same price as the more fully equipped Morris Oxford. These cars were more fondly known as "The Chummy" and sported the standard 12 horsepower engine. At the end of the day these cars were still Cow-leys in disguise and despite their improved looks did not sell very quickly at first. This was mainly due to the price of £350 which was considered expensive when put alongside the newly introduced Morris "Occasional Four" which was available in 1924 priced at £215. Kimber started MG's exploits in motor sport when he entered one of his specially tuned Chummys in the 1923 Land's End Trial, winning a gold medal. This achievement did boost sales marginally of the special bodied Morrises whilst Kimber turned his attentions to producing a tuned version of the Chummy on the 14 horsepower Morris Oxford chassis in order to compete with the Occasional Four. Raworth, the Oxford based coachbuilding company were engaged to build a neat two seater sports body that could be fitted to a slightly modified Cowley chassis. With their elegantly curved wings and their raked windscreen, supported on either side by triangular glass frames, this new model was true sporting machine. To enhance the sporting feel, a pair of boat type ventilators were mounted on top of the scuttle and these were to be a hallmark of subsequent models until 1929. Some consider that the Raworth Sports Model was the first true MG, however the radiator was adorned with a Morris badge and the accompanying advertising literature carried for the first time the stylised MG lettering in the octagon and described the car as "The MG Super Sports Morris". The modifications included flatter road springs, a mildly tuned Hotchkiss engine, bead edge tyres and four wheel braking with servo assistance. By 1926 attentions were turned to the modified Morris Oxford 14/28 chassis that were being fitted up with MG bodies. They still carried bullnose radiators at this time and were considered a very attractive car which stimulated a healthy demand from the sports-minded car buying public. Morris Garages cars were now becoming more widely recognised as MGs and it was simply the bull nosed radiators that betrayed the Morris parentage. Towards the end of 1926 in readiness for the 1927 model year, Morris decided to adopt some new production techniques imported from the American car industry. As a result the traditional bull nose radiator was replaced with a flat front type and a wider heavier chassis was adopted to give more room for passengers inside the cockpit. Kimber had no option but to follow suit with the MG versions and the extra weight of the chassis was a potential threat to the performance. However various modifications were made by the Kimber workforce with the end result of an MG that was equally as fast as its predecessor. Each engine was finely tuned and during 1927 was considerably uprated to 35 horsepower and with modifications to the suspension incorporating flattened springs and Hartford shock absorbers, the ride and handling was much improved. Braking efficiency was also enhanced and the rubber mounted steering system was replaced with a Maries Weller arrangement. The bead edged tyres gave way to the baloon variety and a quieter exhaust system completed the mechanical package. On the styling front , engine turned aluminium side panels replaced plain polished aluminium and an attractive two tone paint scheme finished off the car nicely. The flat radiator MGs were designated 14/40 as opposed to the earlier title 14/28. The '40' came from an optimistic view of the engine power output and was in common with many of the major car producers of the era. There is some confusion over the exact configuration of the model sequence but it is generally understood that the first three mark numbers were 14/28's built between 1924 and 1927 and that they were more commonly referred to as simply "The MG Super Sports" models. The 14/40's were designated Mark IV although to add to the confusion there were some Mark III model 14/28's that appeared with the new flat radiators. The model that superceded the Mark IV at the latter end of 1928 did not have a Mark number allocated. With sales increasing dramatically an enforced move was made in 1927 to a new factory in Edmund Road, Oxford and it was at this time that MG became far more independent of Morris even to the extent of adopting their own chassis number range and the undertaking of all warranty work on MG cars previously built at the Morris factory. 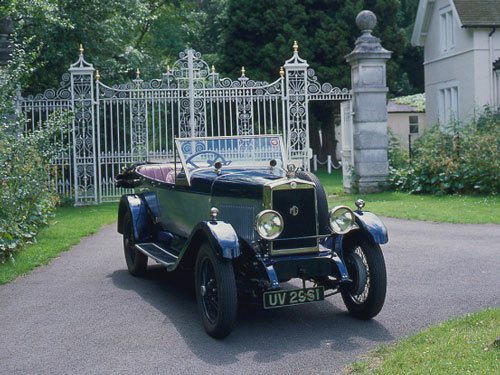 This move to give MG its independence was brought to a logical conclusion when the MG Car Company was formed in 1928.